The Hawai‘i State Foundation on Culture and the Arts invites you to visit the Hawai‘i State Art Museum (HiSAM). HiSAM is located on the 2nd floor of the No. 1 Capitol District Building, 250 South Hotel Street, in downtown Honolulu, Hawaii. Admission is always free. The museum is open Monday – Saturday, 10:00 am – 4:00 pm, and with extended hours on the first Friday of each month from 6:00 – 9:00 p.m. The museum is closed on Sunday and on state and federal holidays. The museum cafe, Artizen by MW, is open for breakfast and lunch Monday – Friday. The museum shop, HiSAM Museum Gallery Shop x MORI, features artwork and gift items made by local artists and artisans. View some of the best contemporary art from across the state of Hawaiʻi in our exhibits! HiSAM is a venue for the Art in Public Places Program of the Hawai‘i State Foundation on Culture and the Arts. Most of the collection is on display in public buildings, including libraries, schools, and state offices. Artworks in the collection are primarily contemporary works by artists with a connection to Hawai‘i. Museum admission is always free! This includes all museum exhibits, events, and activities. The museum is open Monday – Saturday, 10:00 am – 4:00 pm, (with extended hours on the first Friday of each month from 6:00 – 9:00 p.m.), and is closed on Sunday and state and federal holidays. Through a selection of works from the Art in Public Places Collection, this exhibition explores the various ways that artists play with scale, and how this in turn affects the viewer’s responses and understanding. View sculptures, paintings, prints, and photos large and small, including two massive ceramic heads by Jun Kaneko. 2nd floor, Diamond Head gallery. For more information about the artworks in the exhibit, you can see images and information in our online catalog of artworks: EMPHASIZED: eye on scale. This exhibit tells the story of the past examining the overlapping influences of nature’s bounty and human impact on a fragile environment. View a variety of mediums and techniques in these artworks, including paintings, sculptures, textiles, and photographs. 2nd floor, ‘Ewa gallery. For more information, including a link to an online catalog of the artworks: HAWAI‘I: Change & Continuity. Through June 8, 2019. This exhibit invites you to engage with a selection of recent additions to the collection from across the Hawaiian Islands. The thirty-one artworks acquired from eighteen exhibitions offer an insight into current trends and themes in the local arts scene and provides an opportunity to see the diversity of works being created in Hawaiʻi today. SFCA Executive Director Jonathan Johnson says “this exhibit is what’s going on in Hawaiʻi through the eyes of artists.” 2nd floor, Diamond Head gallery. Through September 2019. For more information about the artworks in the exhibit, you can see images and information in our online catalog of artworks: STATE OF ART: new work. On the ground floor of the building was once a recreational area that featured a large swimming pool and bleachers. This area has now been transformed to serve again as an urban oasis. It retains elements that evoke memories of the pool, offering pathways for discovery and sites for reflection. The Sculpture Garden is temporarily closed for landscape and renovation work as of April 15, 2019. See Hawai‘i through the eyes of children! Young Artists of Hawai‘i is an annual student art exhibition that recognizes creative excellence among Hawaii’s public and private school students in grades Kindergarten through sixth grade. A panel of distinguished judges select 96 works for exhibition from school submissions. On the first Friday of each month, the museum galleries are open late, with live entertainment. 6:00 – 9:00 p.m., admission is always free. First Fridays at HiSAM are casual and family-friendly. On the second Saturday of each month, free hands-on art activities for all ages are hosted in the first floor Multipurpose Room. All materials are provided. 11:00 am – 3:00 p.m., or while supplies last. Free “meet the artist” lecture series held on the last Tuesday of each month. Bring your own lunch (or buy one at Artizen cafe!) and feed your creativity! 12:00 – 1:00 p.m. These weekday evening events are being done in collaboration with the HiSAM Museum Gallery Shop x MORI. For more information about upcoming Pau Hana events, please check the events calendar. During museum hours, the hands-on I Love Art Gallery (2nd floor, Diamond Head gallery) gives visitors of all ages a space to learn about art while having fun with building blocks, books, and more. For more information about special events and activities, please see our news and events posts or Facebook Event Calendar. To receive event calendars by mail, subscribe to the HiSAM email newsletter: newsletter sign-up. The gift shop is independently operated under a lease agreement between the Friends of the Hawai‘i State Art Museum, a 501 (c)(3) non-profit organization, and the State of Hawai‘i Department of Accounting and General Services. There is no parking on site. Parking is available at nearby lots, including across Hotel street in the Ali‘i Place building (enter at 1099 Alakea Street, cash only), across Richards Street at Iolani Palace, and metered street parking in the area. Ali‘i Place building parking structure (vehicle entrance at 1099 Alakea Street, pedestrian entrance/exit on South Hotel Street directly across from the Hawai‘i State Art Museum). 2 hour limit. State parking lots allow metered spaces in those lots to be used as accessible parking, with a 2 hour limit. Nearby state parking lots include the State Capitol (415 South Beretania Street and Punchbowl Street), and the Kalanimoku Building (corner of Beretania Street and 1151 Punchbowl Street). For a full list of state government parking lots and a map, please visit the Automotive Management Division webpage. In order to use the spaces, vehicles must display the appropriate placard issued to individuals. TheBus – many bus routes stop directly in front of or very close to the museum. For routes and schedules, call TheBus at (808) 848-5555 or check online at www.thebus.org. The Waikiki Trolley – the Red Line State Capitol Stop is a short walk from HiSAM. For more information, call the Waikiki Trolley at (808) 591-2561, or check online at www.waikikitrolley.com. Biki Bikeshare – the closest Biki racks are directly in front of the building on South Hotel St. (120 Chinatown/DT – Hotel & Richards), and at the corner of Richards and South Beretania St (121 Chinatown/DT – Beretania & Richards). Bicycle Racks – nearby Honolulu City & County bike racks are on South Hotel St. near Alakea St., on Richards St. near South Hotel St., and on the lawn between the Hawai‘i State Capitol building and Iolani Palace. Monday through Saturday 10:00 a.m. – 4:00 p.m.
First Friday of each month 6:00 – 9:00 p.m.
HiSAM is closed Sunday, Monday, and all state and federal holidays. Free guided group tours and docent-led school tours are available upon request. Please allow up to four weeks in advance when scheduling a group tour. More information available here: HiSAM Tours. For individuals and small groups, free guided tours are available upon request (when docent volunteers are available). Check at the visitor’s desk in the second floor Sculpture Lobby, or call (808) 586-9958. The Hawai‘i State Art Museum is the “People’s Museum” and belongs to everyone. Please respect those around you by allowing them to enjoy their own museum experience. Please refrain from touching the art. Please join us in preserving the artwork for future generations. Artwork can be damaged by even the slightest contact. Wheelchair/Stroller Access – Richards Street gate entrance has a walkway leading to the side of the building facing Richards Street. As you come in to the main hallway, turn left to go to the lobby, or turn right to go to the Sculpture Garden. There are two elevators, one on each side of the lobby. Smoking and Food – Smoking, including e-cigs, is prohibited throughout State buildings. No food or drink is allowed in the museum galleries. Pets – No animals are permitted on state property with the exception of professionally trained service animals. For press, professional, and other special photography, please contact the SFCA’s Public Information Officer, Mamiko Carroll, at (808) 586-0305 or mamiko.k.carroll@hawaii.gov. For photo and/or film permits for the building and grounds, please contact Visitor Services Manager Scott Young at scott.m.young@hawaii.gov or (808) 586-9959 for more information. For information concerning permissions or photography of works in the Foundation’s Art in Public Places Collection, please contact Art in Public Places Program Director Karen Ewald at karen.a.ewald@hawaii.gov or (808) 586-0300, or Registrar Ozzie Kotani at ozzie.kotani@hawaii.gov or (808) 586-9956. No professional photographs in the museum may be reproduced, distributed, or sold without permission. The Hawai‘i State Art Museum is available for rentals for special events and parties. Anyone interested in renting the facilities may request or download a HiSAM Rental Information Packet which contains a Rental Handbook, Rental Request Form, and HiSAM brochure. For more information: Facilities Rental Program. The museum café, Artizen by MW, is also available for rental and/or catering. For more information, please contact Artizen by MW. Contact form on their website: Artizen Private Dining Request. 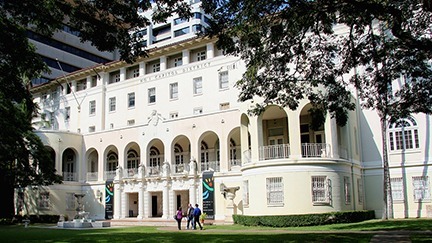 The museum is operated as a part of the Art in Public Places Program of the State Foundation on Culture and the Arts, Hawaii’s state government arts agency. The Friends of the Hawai’i State Art Museum (Friends of HiSAM) is a 501(c) (3) non-profit organization established to work effectively with the Hawai’i State Foundation on Culture and the Arts (SFCA) and its professional staff to enhance and support the work of the museum, its ancillary programs, and amenities. In supporting the mission of the SFCA, the Friends of HiSAM have four objectives: (1) expose and engage all grade school students at the museum to the arts in Hawai’i, (2) encourage all high school and college students who are focused on the arts through meaningful events and programs at the museum (3) expose, excite, educate and engage those living in and visiting our state to the art and artists of Hawai‘i through visits to the museum, and (4) assist the SFCA in the recognition of Hawaii’s art and artists. Most recently, Friends of HiSAM has hosted exhibits of local artists in the seating area of the museum restaurant, Artizen by MW: Harry Tsuchidana: Forgotten Paintings; Across Generations, featuring Satoru Abe, Hamilton Kobayashi, and Kainoa Gruspe; Across Generations II, featuring Ka-Ning Fong and Erin Marquez; Yvonne Cheng: Recent Works; The 2017 HiSAM Portfolio Artists Show; Across Generations: Charles Higa and Michael Teruya; Across Generations: George Woollard, Mary Philpotts, and Kathy Merrill-Kelley; the Hawaii Master Artists Show; Hawai‘i Artists 2018 Portfolio Project, “Mitsukeru: Discovery” with Noe Tanigawa and Erin Yuasa, and a solo exhibit by Jodi Endicott. Friends of HiSAM has also hosted a soft opening for the museum shop, HiSAM Museum Gallery Shop x MORI. The museum cafe and museum shop are independently operated under a lease agreement between the Friends of HiSAM and the State of Hawai‘i Department of Accounting and General Services. The Friends of HiSAM holds an annual meeting which is open to the public.